A unique experience in the serene environs of Himachal Pradesh, come to enjoy an off-road journey on fat bikes from Hampta to Prini. Off-road journey on well maintained fat bikes. Cycle through the serene environs of the Himachali terrains. Service of a professional leader/captain to guide you throughout the tour. Fatbike or fat tired bikes are off-road bicycles which have thick tires which usually are of a size 3.8 inches and also rims of 2.16 inches. This is designed in such a way that the tire exerts low ground pressure, which makes cycling through soft ground, snow, sand etc an easy task. The early versions of fat bikes were developed in limited numbers in the early 1900s but the modern ones came around in the 1980s. 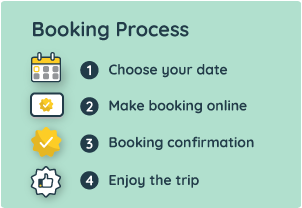 The guests are required to report at the Hampta village at the selected time (Choose during booking). The guide will greet the guests and session on safety instructions will be conducted. All the safety gears and a fat bicycle will be allocated to each guest. The ride goes through the serene views and landscape of forest areas and snow peaked mountains of Hampta to the valleys of Prini. Upon arrival in Prini which is very close to the Old Manali, the tour will end. Manali hotel pick-up and drop can be arranged if requested by the guest. The request can be shared with the local contact person post booking.